Almost all the Grands Crus of Alsace are oriented to the south-east or due south. 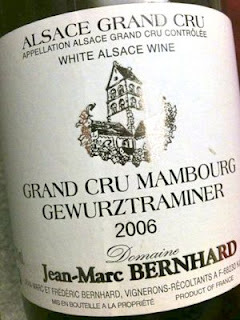 Warmest of all is the Grand Cru Mambourg, which rises like a ski slope over Sigolsheim. Here the snow melts first, and the wines are most often rich, almost thick with a slightly burned and smoky character. Only the most skilled producers are able to master the power of Mambourg and bring out the finess and the minerality that the terroir offers. 2007 Gewurztraminer Grand Cru Mambourg by Jean-Marc and Frédéric Bernhard in Katzenthal is deep yellow. The aroma is extremely complex with plum, elderberry, dried fruits, flint, smoke, and a distinct toasty element as in a mature champagne. The taste is sumptuous and fruity with a hedonistic sweetness which is supported by wonderful acidity and a sandy minerality, supplemented by a slight bitterness in the finish. A bargain! Price: € 13.